The ultimate laptop cooler. The KLIM WIND was conceived to cool down the most overheated laptops. Overheating is the number 1 cause of failures of laptops since it damages the laptop's components. If your PC overheats you seriously undermine its life expectancy. We know our product and we're confident its capabilities, this is why we offer a 5 year warranty, which is a rare feat for electronics. Our team is available and will respond to each and every one of your queries in English. 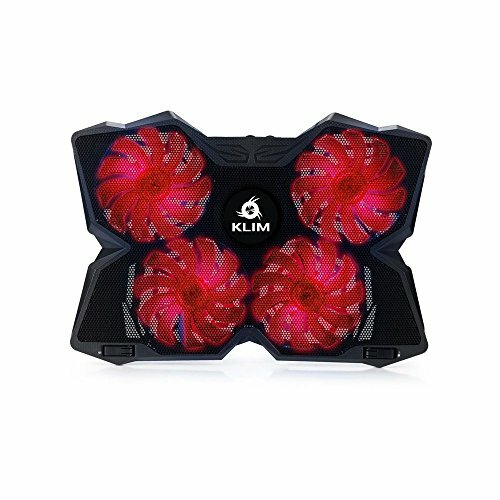 KLIM Wind has 4 fans which ensure a total coverage of airflow to your computer. You can adjust the fan speed with the knobs on the back of KLIM Wind. You won't lose a USB port as there is a usb slot on the laptop cooler itself. ✅ AN INVESTMENT. This cooling pad is an investment => no component overheating => maximises the life expectancy of your PC and boosts its performances. ✔ BONUS : Receive a free copy of the eBook: 7 tips to keep your computer alive and maximise its performance by email after your purchase. ✅ LARGE MODEL. Covers the following sizes : 11 11,3 12 13 14 15 15,6 16. Compatible with the following sizes : 17,3 18 and 19 inches. With these sizes, the laptop will extend over the edges of the cooler pad but will remain perfectly stable. KLIM Wind itself is extremely stable, it will stay completely still. ✅ THE MOST POWERFUL ON THE MARKET. 4 fans spinning up to 1400 rotations per minute. It's a high capacity ventilated support with the ability to cool your PC to reasonable temperatures in under a minute. These 4 fans allow for cooling of all the areas of your laptop. ✅ THOUGHT OUT DESIGN + BUILT TO LAST. KLIM Wind is a level above the other ventilated supports in terms of design and the quality of materials used. We offer a 5 year warranty, proving our confidence in our product. It's a no risk purchase. ✅ MULTIFUNCTIONAL. KLIM Wind has 2 USB ports in order to leave you with one free port. It will cool your PC regardless of its age or of the intensity of its use. Our clients have had excellent results for gaming, photo + video editing and old laptops. If your laptop is overheating and going slow the cooling action will certainly enhance its performance. It can also be used with a PS4, Xbox One or Wii.